Initial admission is only to children of age 1 year 5 months. Click here to enroll through online application. Issue / Submission of Application form is no guarantee for admission. Parents of the selected candidate(s) will be informed over the telephone. Change of Address & Telephone numbers if any, should be notified. Fees must be paid at the beginning of each quarter i.e. April, July, October and January. The last date for payment is the 15th of each quarter. If fees are not paid by the 15th of the first month of the respective quarter, it will be accepted only in the following month again upto 15th but with a fine of Rs.100/-. If fees are not paid even then, the child's name will be struck off the register till all the previous dues are cleared. Fees should be paid by account payee cheque / Draft, in favour of Mongrace Montessori House. Name of the child must be written at the back of the cheque / Draft. If the fee book is lost, a duplicate fee book will be issued against a payment of Rs.50/-. N.B. - Fees are non-refundable. Lower Montessori - 9:30 A.M. to 12.30 P.M.
Upper Montessori - 9:30 A.M. to 12.30 P.M.
A complete list of Holidays can be found and downloaded from the Holidays page. Please ensure that children are sent regularly and punctually to the 'House'. In case of absence, a letter / medical certificate must be forwarded to the Principal. Arrangements must be made to take the child home as soon as the 'House' gives over. Parents / Guardians are allowed to observe their child / children in the environment after a prior appointment. Parents are earnestly advised not to start teaching letters and numbers to their children at home without first consulting the 'Facilitator'. Parents are requested to let the 'House' know immediately if there is any change in their address or telephone number. 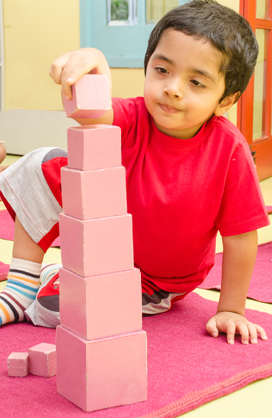 "Mongrace Montessori House has branches in New Town, Kolkata and Vasant Vihar, New Delhi"